"A holiday tradition. My mother made these date balls every year at Christmas time. They may be stored in a plastic or glass container. If the weather is warm, keep them in the refrigerator. Make sure balls are cooled thoroughly before storing." Cook and stir dates, sugar, and margarine in a large saucepan over low heat until sugar dissolves; remove from heat. Fold crispy rice cereal, pecans, and vanilla extract into the date mixture until evenly mixed. Grease your hands with margarine. Roll date mixture into 1-inch balls. 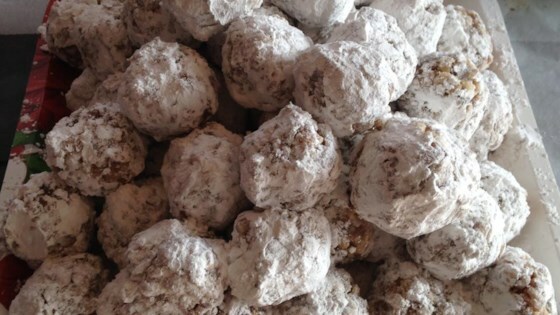 Spread confectioners' sugar into a shallow dish; roll date balls in confectioners' sugar to coat. Unable to roll into balls. Not sure what happened. I'm going to melt marshmallows and pour over dry mixture to see if they can form into balls. Will not make again. Could not roll into balls. Will find another recipe.